OMG OMG OMG! What a dynamite film and fantastic way to book-end summer following last month's sing-along/dance-a-thon Mamma Mia! Lauren and I absolutely ate this thing up with a spoon! Well-written, lushly filmed, and an unquestionable crowd-pleaser. I knew exactly 0% about this story walking in, and floated out two hours later a blubbering, cuddly mess. Man oh man is the ending strong. Gorilla Glue strong. Start your timer: If you're not crying by minute 90, you're a clinical monster! 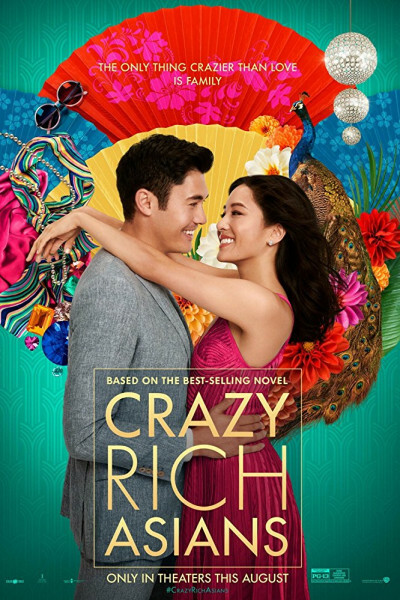 I despise schmaltz and cheese (like vampires resist sunlight, garlic, and pointy wood), so it was 100% refreshing to see Crazy Rich Asians dodge these common movie-killers and serve up, instead, real-life authentic friendships and complicated, honest-to-goodness love. In the final 30 minutes, you'll enjoy as much integrity as can be captured in a romantic-comedic-cross-cultural cine-drama, and see it pinch-pinch-pinch-pinched like the perfect dumpling with friendship, family, food, and grace. I just loved it, absolutely loved it, and can't wait to see it again with my bride. She will cry like a baby. Awkwafina, by the way, is a doll bordering on becoming a national treasure. She's as great here as she was in Ocean's Eight, and then some. Her comedic wit, timing, and delivery are pitch-perfect, and she steals every scene she shares. Bonus: The soundtrack is pretty great, too. Kina Grannis's take on Elvis's 1961 crooner-classic Can't Help Falling in Love left the audience speechless...right up until the moment everyone exhaled and wiped their eyes in the theatrical equivalent of the wave. If you're looking for a great date movie this weekend, problem solved.